Hampton Court Palace is on the SW borders of London. Christopher Wren designed the present east and south wings, and the Fountain Court. In the Clock Court is a superb astronomical clock of 1540, possibly designed by Nicholas Kratzer, 'deviser of the King's horologies', and now running with an 1879 works. Kratzer had been tutor to Thomas More's family and astronomer to Henry VIII. The famous maze was planted c.1690 by George London and Henry Wise and is the oldest extant hedge maze as well as one of the earliest non-unicursal designs. There are islands in the maze, but the 'hand on wall' rule solves it. In 1997, it was reported that the replanting with English yew in the 1960s was done with the plants too close together and so the trees did not produce lateral growth, leaving gaps which have had to be filled with railings or stakes. Possibly the whole maze will have to be replanted. The King's Observatory, or Kew Observatory, is in the Old Deer Park, Richmond. Built for George III by Sir William Chambers and finished in 1769 in time for the King to observe the transit of Venus on 3 June. The prime meridian ran through here before Greenwich. Previously, Queen Caroline had a Hermitage built on the site in 1731, decorated with busts of Boyle and Newton by Rysbrack; these are now at Kensington Palace. In the Old Deer Park are three obelisks, to the east, west and north, used as meridian marks for adjusting the instruments. The King's Astronomer at Kew was, from 1768 to 1782, George III's former mathematics tutor Stephen C. T. Demainbray (1710-1782). He was followed, from 1782 to 1840, by his son Stephen G. F. T. Demainbray (1759-1854), assisted by his brother-in-law Stephen Rigaud, who died in 1814. Stephen Peter Rigaud (1774-1839), the son of Stephen Rigaud and Mary Demainbray, was Savilian professor of geometry, then astronomy, at Oxford; he succeeded his father as Observer in 1814 until his death in 1839. Demainbray brought his collection of instruments to Kew and they were incorporated with the royal collection of instruments bought by George III in 1760-1762 from George Adams, as well as instruments of previous kings. These were later given to King's College, London, and then to the Science Museum in 1927 where they have recently been put on display. In 1772, the horologist John Harrison asked George III to have his H5 tested at Kew. It did not perform well, but the King remembered he had stored lodestones nearby! When these were removed, H5 was accurate to 1/3 sec/day over a ten week period. It ceased as an astronomical observatory in 1841, but continued as a magnetic and meteorological observatory until the early 1980s. Francis Ronalds was Director in 1843-1852. In 1858, Warren De La Rue set up his photoheliograph here and began the first daily recording of sunspots. It has now been renamed King's Observatory and Museum, and converted into the head office of Autoglass Holdings Ltd: to visit it one must make advance arrangements (telephone Mr Douglas Roberts, 020-8907-4193). The London Museum contains one of the most famous of automata - Psycho - devised by John Algernon Clarke and bought and improved by J. N. Maskelyne. The north part of Burlington House, with its entrance in Burlington Gardens, was originally built for the University of London in 1866-1869 and until recently housed the Museum of Mankind, the ethnographic section of the British Museum. Over the central portico and on the parapet of the facade are statues of Archimedes, Aristotle, Bacon, Bentham, Cuvier, Davy, Galen, Galileo, Goethe, Harvey, Hume, Hunter, Laplace, Leibniz, Linnaeus, Lock, Newton, Plato, Adam Smith, and a few non-scientists. The (old) Royal Observatory is located on the hill in Greenwich Park (Greenwich, SE10; tel: 020-8858 4422) overlooking the National Maritime Museum, of which it is now a part. It is of especial interest to those of an astronomical or navigational inclination. It was founded on 22 Jun 1675 by Charles II who commanded Flamsteed to apply "the most exact Care and Diligence to rectifying the Tables of the Motions of the Heavens, and the Places of the fixed Stars, so as to find out the so-much desired Longitude at Sea, for perfecting the art of Navigation". Charles's interest had been aroused a year earlier when the Sieur de St Pierre, a French friend of his mistress, claimed to have a method for finding longitude. This was essentially the method of lunar distances, first proposed by Johannes Werner in 1514. A royal commission, including Wren and Hooke, had already been set up to consider using the dip of a magnetic needle to determine longitude and Charles asked them to study St Pierre's proposal. The commission asked Flamsteed to report on it and he showed the method was theoretically sound, but was impractical as the positions of the moon and the stars were not known with sufficient accuracy. Jonas Moore, governor of the Tower, Surveyor General of the Ordnance, instigated the foundation of an observatory and actually donated the necessary instruments to Flamsteed. Flamsteed's salary was so low (£100 per year, to cover costs of instruments and assistants) that he had to take in pupils and to serve as deputy for Walter Pope, Gresham Professor of Astronomy, from 1681, and to be rector of St Bartholomew's, Burstow, Surrey, in 1684-1719. (Burstow is close to Gatwick Airport, at the border with West Sussex, some 23 miles from Greenwich). Flamsteed's widow removed the instruments, leaving Halley with none. The Astronomers Royal lived in Flamsteed House from 1676 to 1948; this was designed by Wren for, as he put it, "the Observator's habitation and a little for pompe". Hooke directed the construction. The foundation stone was laid on 10 Aug 1675 and the first observations from it were made on 31 May 1676. Several Astronomers Royal are of interest to mathematicians and the others are of some historical importance even if not of mathematical interest, so I will list them (dates are of tenure of the post). John Flamsteed (1675-1719). He was the first astronomer to make regular use of telescopic sights. He also invented the conical projection for maps. His assistant, Joseph Crosthwait, prepared his observations for publication after his death. Edmond Halley (1720-1742), whose tombstone is in the courtyard. He continued as Savilian professor of geometry at Oxford while being Astronomer Royal. James Bradley (1742-1762), who announced the nutation of the Earth's axis in 1748, using the zenith sector that he had used to discover the aberration of light in 1725-1729. This instrument may still be at the observatory. He also continued as Savilian professor of astronomy at Oxford. He resisted Harrison's chronometer as a solution to the longitude problem, preferring the astronomical method of lunar distances which he developed and he hoped for a share of the prize money. Nathaniel Bliss (1762-1764), Halley's successor as Savilian professor of geometry at Oxford. He favoured the method of lunar distances. Nevil Maskelyne (1765-1811). He also favoured the method of lunar distances and seems to have deliberately tried to sabotage Harrison's chronometers and the tests on them, hoping to win the Longitude Prize for himself. He founded the Nautical Almanac in 1766. He determined the universal gravitational constant G in 1774-1776 (v. Schiehallion). Jean (III) Bernoulli (1744-1807) visited the Observatory in 1769. Maskelyne installed the first transit telescope, on the present Prime Meridian. With this and new clocks, it was believed that observations could be made accurate to 0.1 sec. However Maskelyne discovered that he and his assistant Kinnebrooke differed by an average of 0.8 sec and Kinnebrooke was sacked. Bessell later recognized the significance of the difference and developed it into the 'personal equation' of an observer, a phenomenon due to differing reaction times of observers. John Pond (1811-1835), who was requested to resign. George Biddell Airy (1835-1881). Airy's study of oscillatory phenomena in the regulators of the Greenwich equatorial telescopes led to two papers in 1840 and 1850 which are considered the beginning of the theory of automatic control. But Airy is mainly remembered as too busy to consider John Couch Adams' predictions of Neptune in 1846. On Airy's retirement in 1881, J. C. Adams & J. W. L. Glaisher both declined the post. William Henry Mahoney Christie (1881-1910). Chief Assistant from 1870. Frank Watson Dyson (1910-1933). Dyson organized the expeditions from Greenwich to Brazil and from Cambridge to Principe which observed the solar eclipse of 29 May 1919, confirming Einstein's prediction of the bending of light. A. S. Eddington was a prominent member of the expedition. Sydney Chapman (1888-1970) was an assistant. Harold Spencer Jones (1933-1955). He used observations of Eros to determine accurately the distance of the Earth from the sun. Richard v. d. R. Woolley (1956-1971). Martin Ryle (1971-1982). 1974 Nobel Physics Prize for radio astronomy work. From 1972, the roles of Astronomer Royal and Director of the Royal Greenwich Observatory, then at Herstmonceux, were separated and the Directors have been the following. Some other notable persons and events connected with the Observatory are the following. Abraham Sharp (1653-1743) lived with Flamsteed in 1684-1685 and was his assistant in 1689-1696. In 1699, he computed pi to 75 places. In 1730, John Harrison came to see Halley here. Charles Mason (1730-1787), of the Mason-Dixon Line in the USA, was an assistant in the late 18C. John Hellins was an assistant in the late 18C. John William Thomas (1805-1840) was Computor from about 1834 and Chief Computor at the time of his death and was buried in a lost grave at St Alphege's, Greenwich. (v. Llanberis, Newsletter 38 p.42). James Glaisher was Superintendent of the Magnetic and Meteorological Department from about 1840. He was a pioneering meteorologist and made numerous ascents in balloons to make observations, reaching 30,000 feet without oxygen in 1862, a record that still stands. E. Walter Maunder was Superintendent of the Physical Department, c.1890. He announced the eleven year cycle of sunspots in 1904. Philip Cowell was Chief Assistant from 1896 to c.1910. In 1910, Cowell and Crommelin used new numerical quadratures to predict the perihelion of Halley's comet, getting an answer off by only three days. They were able to extrapolate backward and identify all its appearances back to -240. A. S. Eddington (1882-1944), was Chief Assistant (1906-1913). In 1908, Melotte discovered the 8th moon of Jupiter. The Observatory removed to Herstmonceux Castle, Sussex, in 1948-1958, due to smoke and light pollution obscuring the viewing, as well as air pollution attacking the instruments. Herstmonceux is a minute or so two off the Prime Meridian. The Greenwich buildings were turned over to the National Maritime Museum as the observatory moved out. Some departments had already had to move in the 1920s, e.g. the magnetic observations. When the Observatory moved, the London site became known as the (Old) Royal Greenwich Obsevatory and was part of the National Maritime Museum. The Royal Greenwich Observatory left Herstmonceux Castle in 1990 and moved to Cambridge. When this happened the London site dropped the "Old" from its title. The Royal Greenwich Observatory closed in 1998 and in 2012 the London site became part of the Royal Greenwich Museums. The Prime Meridian crosses the Observatory courtyard. Outside is a 24 hour Shepherd slave clock installed by Airy in 1852, part of the system that provided time signals by telegraphy. Beneath it are standards of length, a reminder that the original standards were burnt in the Houses of Parliament in 1834 and had to be re-established. Note the fine views. Entering the Observatory courtyard, you cross the Meridian, marked by a lighted strip. The Meridian is defined by the cobweb on the lens of Airy's transit circle of 1850, which is still in place and in working order, but not in use. The present Meridian was internationally adopted by a conference in Washington in 1884. A report says that a laser beam now projects along it to Essex, but looking through a telescope provided, one sees that a recent building is obstructing the view to the Essex skyline! There were earlier meridians through earlier instruments. From 1750 to 1850, it was 19 feet west of the present one. There is an 1824 obelisk on Pole Hill, Epping Forest, Chingford, Essex, used for aligning the 1750 instrument, but in 1943 it had long been invisible. (A letter to The Times from Paul A. Moxey on 5 Nov 1982 confirms that the view is hidden 'by a dense growth of hawthorn and oak'.) I visited Pole Hill in 1995 and can confirm that the obelisk is difficult to find and there is hardly any view. From 1675 to c.1720, Flamsteed used a Meridian further to the west and from c.1725 to 1750, Halley used a Meridian a bit east of Flamsteed's. Plaques facing the courtyard show the positions of Halley's and Flamsteed's Meridians. The Meridian has been marked a few other places, e.g. in the underground passage at Hither Green railway station. It also passes through the Yacht pub, to the east of the Naval College, and through Greenwich Power Station. In the Lee Valley Regional Park, just north of Waltham Abbey, there is a walk which goes along the Meridian for over half a mile [Limna]. On the pathways from the car park to Waltham Abbey are two indications, a mosaic and a 1995 'Meridian Gateway' by Jon Mills. (v. also Brighton, Holbeach, Lewes, Louth.). Back in the courtyard, enter an annex to Flamsteed House. The first two rooms have material on Flamsteed, Greenwich and the longitude problem. There are a copy of Moore's Arithmetick of 1650, a bust of Flamsteed, a map showing Anson's believed and real routes, Anson's log, a print of Wren and astrolabes from 1360 and c1400. From four small rooms, furnished as in Flamsteed's time, one ascends into the Octagon Room, the original observing room at the top of Flamsteed House. This is one of the few Wren interiors extant, now restored to its original form. There are three replicas of the one-year clocks made by Thomas Tompion in 1676 which Flamsteed used to check the constancy of the day: the first clocks with Tompion's new escapement and the first clocks sufficiently accurate to check the accuracy of the rotation of the earth. One of the originals is in the British Museum. 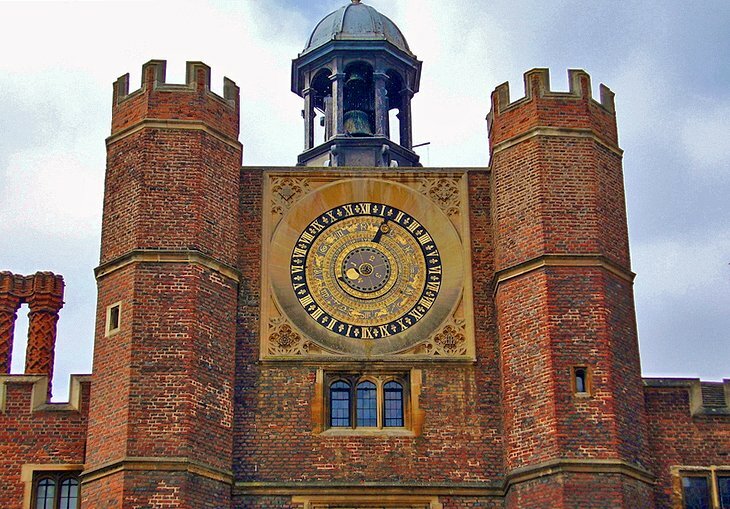 The other was recently located at Holkham Hall, Norfolk, and bought for the Observatory where it is now on display, though it had been much modified for use as a domestic clock. From the Octagon Room, one descends to an exhibition on time-keeping and longitude. The background to this is the disaster when on the night of 22 Oct 1707, Sir Clowdisley Shovell ran his HMS Association and three other ships aground on the Gilstone Ledges off the Scilly Isles, losing about 2000 lives, including his own. This is usually ascribed to his not knowing his longitude. In fact the consensus among his captains was that they were near Ushant at the south entrance to the English Channel, whereas they were approaching the Scillies, about 100 miles north-northwest of Ushant. Thus, the error was more one of latitude than of longitude. Nonetheless, this disaster led to Parliament passing the Longitude Act on 8 Jul 1714, offering £20,000 for a solution of the problem of finding longitude at sea to within half a degree (about 30 miles). At the beginning of this room is material about the longitude problem: a copy of the Longitude Act; numerous proposals of methods; a copy of the first version of William Hogarth's The Madhouse from his series The Rake's Progress which shows a lunatic in Bedlam drawing a scheme proposed by William Whiston and Humphrey Ditton to determine longitude by firing bombs into the air; the first volumes of the Nautical Almanac; Huygens' attempt to make a sea-going clock; etc. The room opens into a larger section. Here are the most notable items of the entire Museum, the original marine chronometers of John Harrison (1693-1776), which solved the problem of longitude. The central cases contain H1 (1735), H2 (1741), H3 (1757) and H4 (the first small chronometer of 1755-1759 which is the most important watch ever made). H4 lost only five seconds in an 81 day voyage to Jamaica in 1761-1762 and when William Harrison predicted landfall at Madeira within a day, Captain Digges was incredulous and bet it would not occur. When it did, Digges offered to buy a chronometer as soon as one became available and presented William and the absent John with an octant, now on display in this room. The return voyage was beset with bad weather, but the total error on both voyages, lasting about 140 days, was under two minutes and should have won the Longitude Prize. There are computer animations showing some of the key points of H1 and H3. H1 weighs about 75 lb and was originally housed in a glazed case 4 ft cube. H2 weighs about 86 lb, but is smaller than H1. H3 weighs about 60 lb. H4 weighs only 3 lb and is 5 inches across. H1, H2, H3 are running, because they have very little friction and use lignum vitae, so are self-lubricating (though H3 needs a little lubrication). These techniques could not be reduced to the size of H4 which requires lubrication and very delicate overhauling every three years, so it has been stopped to prevent wear or damage. To the sides are the only portrait of Harrison, holding the Jefferys watch because H4 was being tested, and an engraving made from it but with H4 replacing the Jefferys watch. There is a model showing how he made his wooden gears. There several of his drawings and a manuscript of 1775. There are also the notebooks of one of the unsung heroes of the story: in 1920, Lieutenant Commander Rupert T. Gould found all the Harrison chronometers in dreadful condition with some covered in corrosion and H1 missing many parts. Maskelyne had dropped H1 and had put all of them in a damp cupboard! Gould spent twelve unpaid years restoring them to working order. There is also a facsimile of Harrison's large Royal Astronomical Society regulator, accurate to one second in a hundred days. In the far case are various developments of H4: K1 (1770), the first replica of H4 made by Larcum Kendall, costing £450 and used by Captain Cook on his 2nd and 3rd voyages-it lost only 7 minutes and 45 seconds on the 2nd voyage of 3 years; K2 (1772), the second replica, costing £200, used by Captain Bligh on the Bounty - it was taken to Pitcairn Island and bought by an American whaling captain in 1808; K3 (1774), costing £100 and used by Cook on his third voyage and by Vancouver; examples and materials of Earnshaw and Arnold who developed cheaper versions. Down another staircase is an exhibit on Greenwich Time, etc. The big clock in the middle uses Grimthorpe's 'double three legged gravity escapement' which he devised for the clock in the Houses of Parliament. There is an early electric clock of 1845 by Alexander Bain, who patented the idea in 1840. There is a facsimile of Congreve's rolling ball clock: the original is in the British Museum. The 1852 Shepherd Clock which electrically drove slave clocks and provided time signals by telegraphy is here. There is a 19C railwayman's clock, which was set to GMT and sealed to prevent changes. A Japanese pillar clock has movable hour markers because they used 'temporal hours' obtained by dividing the day and the night into twelve equal parts, whose lengths vary with the seasons. And there is a digital hourglass (!!) of 1990. In the 20C, Atomic clocks replaced astronomical observations as the basis of time-keeping. Coordinated Universal Time (UTC) is the average of 11(?) atomic clocks, mostly using vibrations of caesium-133 atoms. The earth runs a bit slow leading to the occasional introduction of 'leap-seconds' at the end of the year. Currently one or two occur per year. All observatories and radio stations, etc., now use UTC (since about 1980), but GMT is still the legal time! We now pass through several old viewing rooms with many instruments on display -the collection of astrolabes is the second largest in the world. There is a five foot transit instrument made by Robert Hooke and George Graham for Halley in 1721, the first transit instrument in England. On the side is Bradley's 12 ft zenith sector, built by Graham in 1727, designed to observe the zenith of a Draconis and which established the nutation of the earth. There is also Halley's 8 foot mural quadrant of 1725. This defined the Prime Meridian until 1750 when Bradley had an 8 foot transit instrument built in the next room by John Bird. There is a portrait of Halley. In the case to the side are many instruments including the first sextant, made by John Bird in about 1757. The site of the Bradley instrument defined the Prime Meridian until 1850, though the instrument was replaced by a 10 foot instrument by Troughton in 1816. In 1850, Airy had a transit circle built which was accurate to 1/100 seconds of arc. This is still in place and in working order -- its crosshair still defines the Prime Meridian -- it was last regularly used in 1954. The latitude of the crosshair is 51degrees 28' 38" and the altitude is 153.83 ft. There is a portrait of Airy. When you descend, walk through the garden to the Planetarium in the South Building. Beside it, under a plastic dome, are the remains of William Herschel's 40 foot telescope from his house at Slough. It was the largest telescope in the world and he used it to discover two moons of Saturn. John Herschel dismantled the telescope in 1840 and a falling tree broke up the tube, so only a short section is here. The South Building was erected in the late C19 to house the computers - who were humans in those days. Above the windows are carved the names of notable astronomers, etc. I recorded Adams, Arnold, Bird, Bliss, Bradley, Dollond, Earnshaw, Flamsteed, Graham, Halley, Harrison, Herschel, Newton, Sharp, Sheepshanks. The Museum has a small display room in its storage area containing some of the many items not in the main displays. A serious student may be admitted upon application to a curator-ask at the ticket desk. This room currently includes the earliest(?) theodolite, signed by H. Cole and dated to 1574 (but I didn't see if the date is on the instrument) and surprisingly small, perhaps 5 inches high. It was invented by Leonard Digges in the 1560s and he presumably made examples then, but none are now known. There is another earliest(?) theodolite at Oxford, signed "Humphrey Cole, 1586". The room also has a sundial of c1635 engraved with William Oughtred's double horizontal quadrant of the 1620s; Oughtred was the inventor of the slide rule and this dial was probably made to his specification. The National Maritime Museum, at the foot of the hill, opened in 1937. In 2012 it became part of the Royal Greenwich Museums. Behind the West Wing, notice the handsome Dolphin Sundial, designed by Christopher St J. H. Daniel for the Queen's Jubilee in 1977. There is a statue of Cook between the West Wing and the Queen's House. The central building is the Queen's House, designed by Inigo Jones in 1616. It reopened a few years ago after several years in restoration. In the roadway by the entrance is a reproduction of the memorial to Cook erected by his friend Admiral Sir Hugh Palliser at his country house, the Vache, Chalfont St Giles, in 1781. The Great Hall is also known as the Cube Room, being of that shape. The spiral staircase, called the Tulip Stairs, to the upper floors is very elegant and was the first cantilevered stairs built in Britain. (The statics of a cantilevered spiral staircase is intriguing.) Note the fine views from the gallery and the loggia. Since this was a royal palace, most of the rooms have been restored to their royal state and are filled with paintings of royal, maritime and Greenwich subjects, including a room on Wren and the design of the Royal Naval Hospital. At the end of the tour are two rooms presently devoted to Captain Cook and the Endeavour. These primarily display paintings made on the voyage and after the voyage by William Hodges, including a portrait of Cook, and botanic pictures by Sydney Parkinson, who died on the voyage. There are also plans of the Endeavour, a bust of Banks, Cook's charts of New Zealand, Tahiti, etc. and an engraving of the first drawing of a kangaroo. In 1997, most of the West Wing was closed for reconstruction and the part that was kept open is of no scientific interest. I append here my older list of items of interest, against the time when the West Wing reopens. Many navigational instruments, maps, globes, books, portraits, etc. in this room. There is an astrolabe, found at Valentia Island, Ireland, from a Spanish Armada ship. There is a 1537 celestial globe, designed by the noted mathematician Gemma Frisius and engraved by his pupil, Gerhard Mercator. There is a reproduction of the earliest known world globe, by Martin Behaim of Nuremberg, in 1491. There is a 1456 map of the Mediterranean and Europe and a 1535 map of the North Atlantic. Further on is an example of the earliest printed sea atlas. Portraits include Prince Henry the Navigator, Da Gama, Columbus, Amerigo Vespucci, Sebastian Cabot, Magellan and Galileo.